Today’s video facilities need to manage a wide variety of image and transmission formats. Weigh the many converter options carefully. Everyone knows what standards converters do, right? Broadcast professionals recognize that changing the video format and frame rate is necessary when sharing materials internationally or when integrating movies into TV schedules. In fact, there are many types of standards conversion available. Here is a guide to understanding the options. Standards converters were once expensive hardware assets that often needed an expert to configure. Today, motion compensated HD conversion can be handled within a single modular device. For non-live applications, file-to-file conversion workflows are supported by software standards converters, where key functionality and processing is ported to a software implementation. Today, laptops, tablets, mobile devices, and even home TVs have built-in scan convertors. That being the case, there remain at least three general questions. Do we still need standards converters? Is a 23.98p master a "universal" format? Finally, with cloud playout, is there still a place for a converter? These issues and more lead to a number of myths and a fair amount of misunderstanding about standards conversion. This article will correct many of them. A lot of human time and industry money is spent trying to establish standards, norms, and working practices in an effort to harmonise international broadcasting and improve interoperability. One result is that broadcasters might assume that studios and content distributors are all working to the same formats and frame rates. The situation is quite the opposite. The arrival of UHDTV has added another format to the hundreds already in use, with 4K already common in content services, and 8K in trials. With UHD comes the opportunity for Wide Colour Gamut (WCG) and High Dynamic Range (HDR), the latter of which has multiple variants. Film producers continue to shoot with wide aspect ratios (e.g. 2.35:1), whereas domestic TVs remain firmly fixed at 16:9. The result is a proliferation of different formats and frame rates, which exponentially increases the number of conversions required to serve a global audience. It is not just in the distribution chain that standards converters are needed. With the availability of so many different settings, modes and frame rates, the chances are good that a source clip will turn up in the wrong format for your production. Most projects do not have the budget or time to re-shoot footage that arrives in the wrong standard. The solution is a reliable, high quality standards converter. Let us examine some options. Because software players can generally accommodate a range of different frame rates, streaming content services targeting mobile and web services are less likely to need frame rate conversion. Much effort goes into developing the best streaming protocols suitable for http web server infrastructures, with an assumption that the player will accommodate the content as it arrives. The problem is that the user's display refresh rate is unlikely to be the same as the streamed clip's frame rate. This means the software player has to make a frame rate conversion. Unless the user has a multi-rate display, additional processing is needed to overcome the motion artifacts that result from a mismatch between playback rate and display refresh rate. The need for good quality standards conversion is especially relevant for apparently "simple" conversions such as 59.94Hz to 60Hz. Typical U.S. TV services are sourced at 60/1.001Hz, commonly abbreviated to 59.94Hz, but also often referred to as "60Hz.” Many PC monitors have a refresh rate of 60Hz, and the fractional difference between source and display rate tends to be accommodated by a simple frame repeat every 1000 frames. For a 59.94Hz interlaced source, this occurs about twice a minute. Such a repeat may go unnoticed if the scene has complex detail with relatively little movement. However, it can be quite jarring when there is fast, smooth motion, such as a skier gliding downhill or a smooth camera pan across a landscape. Alternative methods using a frame blend instead of a repeat may be equally disturbing, especially for high resolution, detailed scenes. The only solution that preserves the intrinsic quality and motion profile of perfectly produced content is to use a motion-compensated standards converter. A motion-compensated converter should analyse the movement in the scene, and create new frames at the appropriate temporal positions and then insert that content into the correct portions of the image. Compared to proprietary hardware, software standards converters are assumed to be lower cost and more flexible. However, software converters are not always appropriate, and where they can be used, the cost savings may not be as large as anticipated. In live transmission applications such as outside broadcast trucks, TV broadcast centres and national/international teleports, standards, and format converters are in use 24/7. Incoming feeds may need to be synchronised, colour corrected, frame rate or format converted, and other small fixes added to correct for upstream errors such as noise reduction and audio resynchronisation. This 4K converter is well suited for live frame rate conversions where UHD content sourced at a chosen production frame rate needs to be converted to other frame rates for international contribution and distribution. On the outgoing side, conversion may be needed to ensure that the correct format and frame rate content is routed through to each transmission channel. Such applications require dedicated, reliable converters, which must be simple to set up and remain in service without attention for many months. Hardware converters are absolutely the best solution for these applications. In other facilities, frame rate conversion is needed less frequently, but format conversion needed permanently. An example might be a national news channel requiring signal-processing tools to handle material coming from in-field reporters. Format converters are needed here, not only to manage same frame rate conversions such as upconversion (e.g. from HD to UHD) but also to fix upstream problems such as audio/video delay mismatch, synchronisation, and colour correction. In network centres managing hundreds of incoming feeds, power and space are scarce resources. This is where efficient converters handling multiple channels in a 1U form factor are ideal. Such products are readily available in hardware, and are relatively low cost. Fulfilment of the above requirements in software is technically possible but may not result in any cost or power savings. In fact, the opposite may be true. A real-time software converter will need SDI I/O for current applications, which implies the addition of SDI I/O hardware into the server on which the conversion software will run. Although inexpensive, such hardware adds both cost and additional power requirements. Future solutions based on SMPTE ST.2110 I/O will remove the need for SDI I/O but require a high-speed network port. Achievement of real-time standards conversion in software requires either a large number of CPUs or availability of multiple GPUs, both of which add cost and increase power consumption. Typically, a high performance server is needed, which can occupy up to 4U of rack space, weigh up to 30kg and may consume 1kW or more. High performance servers also require additional cooling, which may restrict their location and increase cost. A dedicated 1U hardware converter will consume perhaps 20W and weigh around 2.5kg. In the event of failure, a small hardware converter is easier to swap out than a large, server-based software converter. In file-to-file applications, software standards converters clearly demonstrate their value. The postproduction workflow favours software solutions that can be easily integrated into a media asset pipeline, based on a preferred in-house format. However, a software standards converter per se does not intrinsically save money; cost savings come from careful design for simple workflow integration. If the software standards converter runs on specific hardware e.g. targeting a precise set of GPUs, then the user needs to set up a dedicated machine for the converter. When in use for conversion, the GPUs will block other processes. When not performing standards conversion, the processing hardware is available for other tasks. Nevertheless, the reality is that users may be reluctant to start other processes on the "converter" hardware if there is the chance of needing a standards conversion on short notice. When software converters are integrated into a production workflow, they can save both time and money. In particular, workflows that wrap the converter into what can appear to the user as a single process, targeting a VM, enable the conversion to be performed at any time on any platform. Where content workflows have been ported to the cloud, a tightly integrated software converter can save data transfer costs into and out of the cloud. Provision of an easy-to-use API along with the converter makes such cloud-based applications attractive to end users. 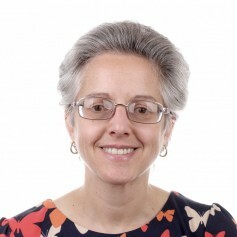 Paola Hobson Ph.D., Managing Director at InSync Technology.